“WHY is classical music just western music?” director of the Sydney World Music Chamber Orchestra Richard Petkovic asked his audience at the Q last night. There is a simple answer to that – it isn’t, and this was perfectly illustrated in three of the exquisite solos in “Three Sides of Love and Death” concert at The Q last night. Hosted by Queanbeyan City Council and supported by Musica Viva, Southern Tablelands Arts and the Goulburn Regional Conservatorium, the evening saw a disappointingly small but interested audience tapping its feet to a combination of fusion music, pop and virtuoso classical performances from many traditions. Petkovic’s impressive line-up of musicians from the western suburbs of Sydney — everything from the Chinese erhu to the violin—speaks to the rich demographic of the region. 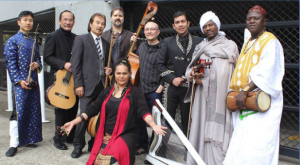 Canberra and Queanbeyan are no less rich in cultures, though not always the same ones as this orchestra’s, and it is with such potential in mind that STARTS planned this concert at The Q, hoping to stimulate diverse musical practice. With limited promotion and advertising and at a time of the year jam-packed with alternative concerts in all genres, few people knew about it and even fewer signed up for the planned music workshops, which had to be cancelled. Performing on the stage of The Q is very different from performing in the orchestra’s own constituency at events like Parramatta’s ‘Parramasala’ festival, for the audience here was largely grey-haired and respectful but not deeply involved. The performance itself was uneven, with some of the modern compositions on the banal side, not at all “a symphony of musical and spiritual collaboration,” as is their stated aim. Indeed there was such a whirlwind of themes and musical ideas that it was hard to detect the “Three Sides of Love and Death” of the title. We heard a spoken word homage to the shark taken from Ambon’s heritage, a paean to the crocodile from Yolngu artist Gambirra Illume, and a mixed musical homage to the dragon from Chinese instrumentalist Nicholas Ng. All the musicians joined in the vocal backing and as well, harpist Victor Valdes leapt downstage to execute a few flamenco steps (he was originally trained as a dancer) and Ng performed dance moves while the orchestra played—this might have been more effective in a less conventional theatre space. In the end, the finest moments of this concert or came from classical music traditions, where the focus and mastery of the instrument was to the fore. This was seen in the opening performance on the Mongolian horsehead fiddled by Bukhu Gamburged, whose singing and whistling also underscored many works in the concert. Victor Valdes’ performance on Mexican harp of a funeral composition showed a delicate, light touch, while a rhapsodic performance by Shohrat Tursun from the East Turkestan song cycle about the Islamic world’s Romeo and Juliet, ‘Layla and Majnun’, delighted the audience. Happily, the musicians were all warmly applauded at the end. Whether it presages future appearances in this immediate region remains to be seen – a one-off appearance out of cultural context doesn’t seem the way to go. Petkovic clearly approaches performances as an iconoclast, blending spoken word, original popular compositions, classical recital and even dance into an end product without the smoothness of a potpourri. Perhaps the organisers’ description of it as “a kind of delicatessen of cultures” sums up both the strong and the weak points – you can choose what you like.